Global Medical Foam, Inc. offers a comprehensive and complete line of Pressure Management Products. 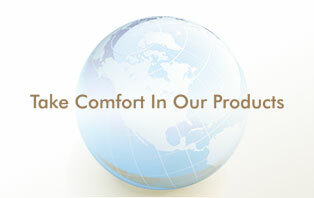 We are an industry leader and the only one in the marketplace who can offer you the patented Conforming Comfort® line. This patented line promotes even tissue load distribution, secure positioning, as well as a specially designed core center to prevent bottoming-out. This entire patented line is developed around the AHRQ Guidelines. Global Medical Foam, Inc. is proud of our ability to manufacture and continually develop products designed to meet you needs. We have on our product and development committee a Certified Surgeon as well as many other healthcare professionals. We are pleased with the results for prevention and treatment of our patented Heel/Arterial Device, which provides True Pressure Relief and Pressure Reduction. Pressure mapping results on our patented line range between 18mmHg and 20mmHg. This is well below the 32mmHg thus, being in compliance with AHRQ Guidelines! We can help you stay afloat in the hard times. All of our products are user friendly as well as providing comfort for your patients/residents. Many hospitals and long-term facilities have written our Heel/Arterial Device into their protocol and formularies. We have put extreme effort into our fabric knowing we must address many issues, beginning with pressure mapping to incontinence. Most products come with a monolithic, fluid-proof cover, which is highly washable/dryable. Take Comfort in our products. Copyright © 2019 - Global Medical Foam, Inc.